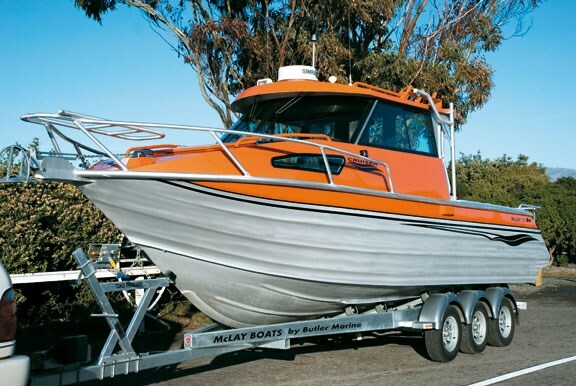 Milton’s McLay Boats has been building alloy trailer boats for more than two decades. The 775 Cruiser is the largest in the range and a highly spec’d version was recently delivered to its new owner, who intends using it at various South Island locations..
Our test morning on Lyttelton Harbour was subject to a typical Canterbury frost (around three degrees), so it was gratifying to see the cabin heater in defrost mode as we arrived. The 775 sits on a triple axle Toko trailer, and with a towing weight of 3500kg, a suitable tow vehicle is required – Toyota’s Landcruiser makes easy work of it. The electronic Hydra-Star braking system operates on four wheels and since this rig is to be towed to various South Island destinations, a triple axle rig offers added durability. The bow is protected by a sturdy alloy railing and a bow-mounted boarding ladder folds back over the foredeck. An alloy fairlead secures the anchor (operated by a helm-activated auto windlass). Grab rails welded to the forecabin top either side, as well as along the wheelhouse top, assist when moving to the foredeck. The forecabin is nicely lined throughout – no bare alloy. A hatch in the front bulkhead gives access to the anchor locker, while a large solid alloy hatch provides access to the foredeck. Natural light pours through side windows. Full length parcel trays run either side of the cabin and the vee berth’s converted to a double berth with infill squabs. Quality upholstery comprises of soft, dark fabrics that contrast well with the grey marine carpet and linings. The wheelhouse’s well appointed and, like the forecabin, fully lined. A curved glass windscreen offers excellent visibility for’d, while sliding glass side windows and fixed quarterlight windows in the rear bulkheads enhance a feeling of space. 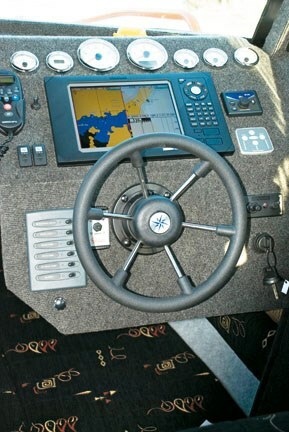 A Simrad CX44 combo radar, plotter and sounder takes pride of place in the centre of the dashboard. Auto-pilot, auto trim tabs, windlass switches and wiper/washer controls are all well placed, while the electronic throttle/forward/reverse control falls easily to the starboard hand. A treadplate alloy footrest and a sensibly-located seat provides a comfortable helm position. There’s good storage under the helm seat’s base. The Navman VHF and Sony sound system head unit are located in a roof-mounted binnacle that curves around the shape of the windscreen. The Webasto diesel-fired cabin heater can also be used to heat the hot water cylinder, but the primary source of hot water for the cylinder is the engine heat exchanger. The galley (aft of the starboard helm seat) is a compact stainless steel unit comprising of two gas rings and a sink with hot and cold water. There is a large storage cupboard beneath it and an alloy cover (with a removable squab) folds down over the unit to provide another seat if required. 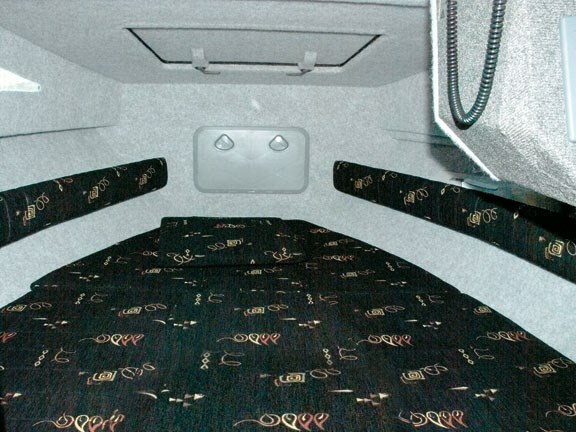 To port, the front passenger seat has full storage below, while the back rest can fold flat, so when the small timber-topped table is lowered, another single berth is created. The refrigerator’s in the base of the rear seat. 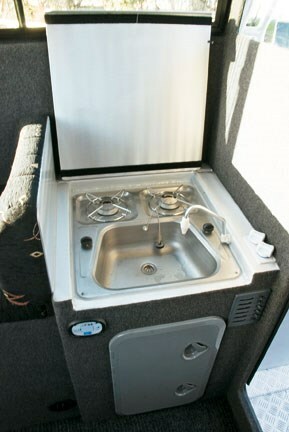 An underfloor locker between the seat bases contains three 20-litre removable fresh water tanks, as well as the 20-litre hot water cylinder and a greywater holding tank. An alloy bi-folding door leads to the cockpit with its treadplate sole. 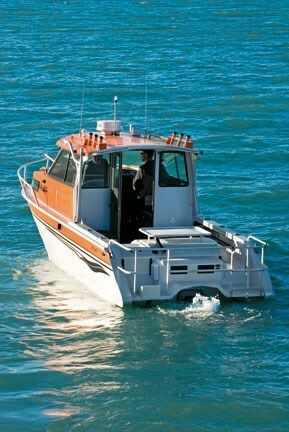 To starboard, mounted hard up against the wheelhouse bulkhead is an alloy base with a removable upholstered seat squab. The electric macerating toilet is located beneath this and a curtain on a stainless steel rail is fitted to the roof overhang for privacy. A similar seat base on the port side contains the gas bottle. Full length parcel trays are built into the cockpit coamings and along the cockpit sides. Access to the full width boarding platform is via a cutaway on the starboard side of the transom. The engine box does not overly intrude into the cockpit thanks to the engine’s short overall length. It’s well-insulated cover hinges forward, giving easy access to belts and filters. A transom shelf holds three batteries – start, house and refrigerator. Wide coamings feature three rod holders welded in on each side. Additional storage for six rods comes in two longitudinally-mounted launchers either side on the wheelhouse roof. This allows plenty of space for an inflatable on the roof (if required). An alloy davit folds away alongside the wheelhouse on the port side, and its electric winch is activated by a footswitch. A useful feature is a 50mm diameter wash-down hose. 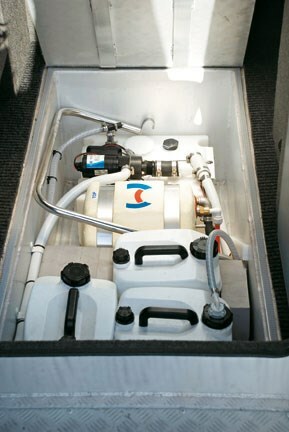 A transom-mounted electric pump (3800gph) provides a healthy flow that can be directed around the cockpit to simplify clean-up operations. The water drains into sumps in either corner aft, where twin 1100gph pumps discharge overboard. There’s a pump in the engine bilges (2000gph) and another manual pump (1100gph) located on a slider so it can be pulled forward for servicing from its usual position right aft. This McLay is fitted with a Volvo D4-260/DP and sterndrive. The four cylinder diesel engine displaces 3.7 litres and features four valves per cylinder with double overhead camshafts. The fuel system (electronically controlled, common rail injection) is complemented by an air induction system using both a belt driven supercharger (for instantaneous, low down boost) and a freshwater cooled turbocharger that delivers the required boost at higher engine speeds. The sternleg (with duo counter-rotating bronze propellers) is equipped with a power-assisted steering system that’s light and smooth. By the time the boat had been launched, a brisk nor’east breeze had developed, stirring up a short, sharp chop. We set a course toward the harbour heads where we knew the wind would create some nice, messy conditions. 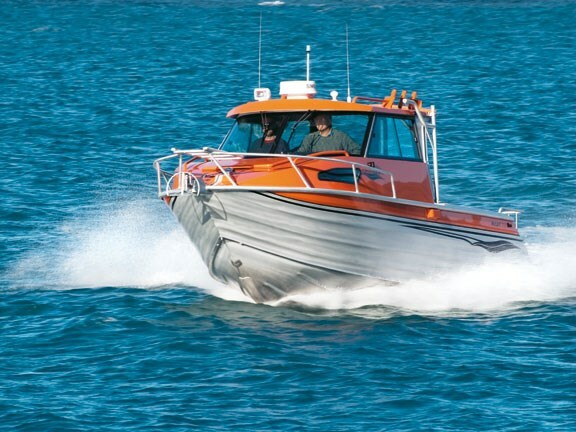 The McLay held a relaxed cruise of 22 knots at 2500rpm and the auto trim tabs were left to their own devices – one less thing the helmsman had to think about as the boat punched its way through the chop. All the while the windscreen remained clear of spray, indicating the wide turned down chines were doing their job well. Beyond the heads we found a confused sea. The power-assisted steering was an absolute delight while the duo props gave real bite and grip as we performed a series of moderate speed manoeuvres. While we took a fair amount of wind spray on to the screen, the fresh water washdowns and intermittent wipers provided good visibility throughout. Running before the swell also proved the McLay is a competent handler, showing little inclination to knife off line, and again, the autotabs looked after themselves coming up as we increased the boat speed. 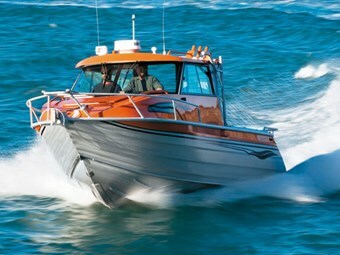 I think the McLay 775 carries the weight of the Volvo diesel and leg very well, making for a nicely balanced and confidence-inspiring blue water cruiser. You sense it could handle anything thrown at it. While sea conditions didn’t allow for a top speed run, the boat evidently makes around 36 knots at 3500rpm. The Volvo consumes around 20 litres per hour at 2500rpm, rising to around 65 litres per at wide open throttle. Given the 400-litre fuel tank, the boat has a useful cruising range. The other factor worth noting is the acceleration. When the throttle is opened from displacement, the boat is very quick to plane with no sign of lag, and the transition from belt-driven supercharger to exhaust-driven turbocharger is seamless. The drive from the duo prop is superb and the thrust is really noticeable when manoeuvring at idle speeds. This is a very well spec’d version of the McLay 775 Cruiser and, given the level of specification, the rugged build and the high level of fit and finish, it should last its owner a lifetime.